It may be more than just an energy boost that comes from drinking your morning coffee. This powerful bean also has the ability to awaken your skin from the inside out. Not sure how? Check out some of the ways caffeine doubles up as a natural skin care product and helps you look more vibrant and youthful. 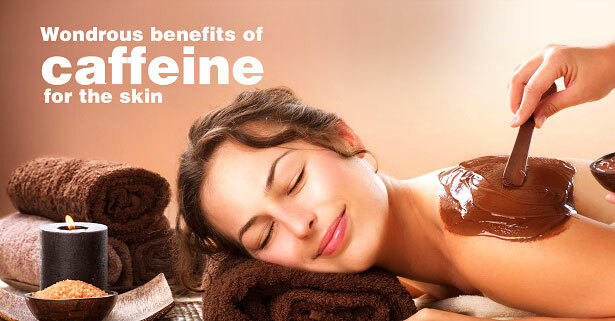 Caffeine acts as a natural exfoliant which boosts collagen production and reduces cellulite! By mixing coffee grounds with water and olive oil you can create a cellulite-removing scrub for your body. The caffeine in the coffee grounds works especially well to help firm skin and reduce the appearance of cellulite. Shampoos and other hair products based on caffeine immediately penetrate to the hair roots and increase blood circulation in the nearby capillaries. As a result, hair follicles are more easily and quickly renewed. Caffeine-based preparations are therefore very efficient hair growth enhancers. Caffeine can be a great ally for men who suffer from baldness caused by an excess of testosterone. Another way to indulge in the benefits of coffee is using it as a face mask treatment. Mix organic grounds with cocoa powder, whole milk, lemon juice and honey for a deep-cleaning facial mask. Apply it to your skin for 15-20 minutes and then rinse it away for clean pores and smoother skin. Free radicals are responsible for causing premature skin aging. This results in the appearance of wrinkles, sunspots and loss of elasticity. The antioxidants contained in caffeine can attack these free radicals and eliminate them, improving the overall look of your skin. Under eye dark circles can be caused by various factors such as dehydration, allergies, lack of sleep or genetics. Although caffeine cannot cure hereditary dark circles, its anti-inflammatory properties make it beneficial in reducing puffiness and inflammation associated with dark circles. It can also reduce the accumulation of blood under your eyes, which contributes to dark shadows. Look for eye creams that contain caffeine or if you want a cheaper option, try applying moist tea bags under your eyes for 5 minutes to reduce dark circles and puffiness. So, these are some of the pretty perks of your morning brew (and just be sure to stick to the recommended limit of 400 mg of caffeine per day to avoid dehydrating yourself).